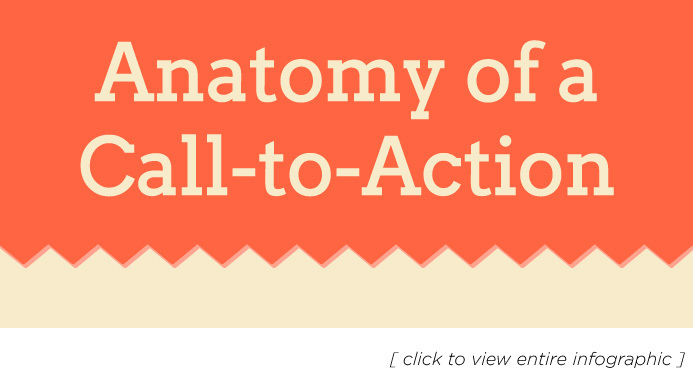 A call to action (CTA) is any image or text that both asks the reader to take an action and gives them a way to do it. In many cases, CTAs are clickable images, like buttons that say "Click here to subscribe!" or stylish images with a messages. Other times, they're just simple in-text links. In all cases, however, CTAs direct your website visitors to important pieces of content or places where they can take an action, like subscribe to your blog, submit a form, or download an ebook. They can also be used to drive traffic to other important parts of your website, like a special offer or event. When you're creating any CTA, there are a few things you need to think about. First, what is the ultimate action that you want your visitors to take? CTAs are usually used to get a visitor "into your system," so you can track them as a lead, get in touch with them again, and offer them other things they might want (all with their consent, of course). For example, say you want people to subscribe to your blog. You wouldn't necessarily want a CTA to take them to your blog feed, where they can scroll through and then choose to go elsewhere. You want to take them right point of conversion, like the blog subscription page, so you can encourage them to sign up right now! The copy for the CTA needs to be clear and concise. Focus on what you're offering and why it will benefit them. The visitor needs to know what the purpose of the CTA is at first glance, and if you fill it up with unnecessary text, the message will get lost. Action verbs like “contact,” “download,” and “click” are important, but the most important thing is that the copy on the CTA accurately reflects what will happen and what they get. This needs to be an interaction that builds trust, not makes them feel confused or tricked. After creating compelling copy for your CTA, it's time for eye-catching design (my favorite part!). The ideal size for your CTA depends on its final destination on your site. Will it be placed at the bottom of a relevant blog post, featured on your home page, or slipped discreetly in between two paragraphs? Let the placement on the page determine the look of the CTA. Contrast is really important with CTAs. Don’t be afraid to use unconventional shapes; something unusual or unexpected will draw the visitor's eye even more. Choose colors that stand out from the page, but complement your color scheme. CTAs can be made up entirely of typography and a nicely styled button, or you can include other visual elements or even an image of your ebook, template, or whatever it is you're offering. We place a CTA at the bottom of most of our blog posts, and matter of fact, you'll see one in person at the bottom of this post. We use a bright colors, cool phots, and interesting typography to make our CTAs stand out from the rest of our site, because as you can see, we have a pretty simple color palette. We use action verbs to create an urgent feeling and entice visitors to take us up on one of our offers. Since it's a proven fact the human race enjoys free things, why don't you check out our free How to Create an Effective Inbound Marketing Campaign ebook linked at the bottom of this post? Like what you read, and want to share it with the world? Here's a link to an infographic I created, just because I love to make infographics. Pin it, tweet it, Facebook it—go on a sharing frenzy if you like. Now, go forth into the internet world, create your own CTAs, and convert those visitors into leads! Editor's note: This post was originally published on 5/7/14 and has been updated to reflect changing best practices.